The European (Eurasian) golden-plover (Pluvialis apricaria) belongs to the family of plovers and lapwings, the Charadriidae. The European golden-plover species is distributed in northern Eurasian region, western Europe, Mediterranean region and north Africa. The golden-plover species are migratory birds. These golden-plovers are polytypic species. The European golden-plover (Pluvialis apricaria) is a large and bulky golden-plover, measuring 25 to 30 cm in length and weighing 140 to 310 gram. The wingspan is 65 to 75 cm. The adult European golden-plovers have different summer and winter plumage. The crown, hinderneck and upperparts of the breeding male have black, white and golden flecks. Much of the head, neck, breast and belly are black or blackish gray. A white stripe from forehead passes as supercilium and extends downwards along the neck to the flanks. The vent and undertail coverts are white. The female European golden-plover is much similar, but the pattern is interspersed with white feathers. The underwing is whitish. The wintering European golden-plover has grayish black upperparts with dense golden flecks. The white flecks are nearly absent. The breast and flanks are also streaked in similar pattern. The belly is white. The juvenile has upperparts with white and golden pattern and the underparts are whitish. The bill is brownish gray in wintering European golden-plover and is blackish in breeders. The irises are dark brown. The legs are comparatively short and are blackish. The European golden-plover call is a soft, plaintive, whistling "toohooh" or "puuuu" sound. 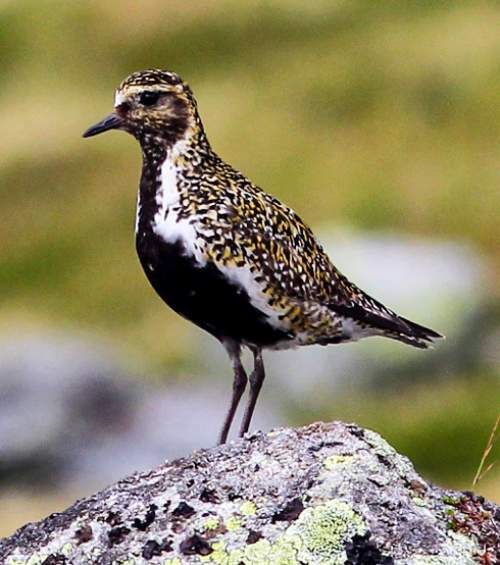 The European golden-plover species is distributed in northern Eurasian region, Nordic countries, western and southern Europe, Mediterranean region and north Africa. Vagrant European golden-plovers were observed in India, Pakistan, Saudi Arabia, Jordan, Bahrain, Iraq, Gambia, Ghana, Mauritania, Senegal, Sierra Leone, Canada and USA. In India, these golden-plovers had been recorded from Assam (Dibrugarh, Dibru-Saikhowa National Park, 2005), Uttar Pradesh (Lucknow, 1880), Gujarat (Kutch, 1990), Punjab (Harike, 1996), Odisha (Chilka Lake, 2001, 2003), West Bengal (Sagar Island, 2007) and Himachal Pradesh (Pong Lake, May 2013, by Abhinav et. al). The Important Bird and Biodiversity Areas (IBA) of these European golden-plovers in Russia are, Verkhnevisherski mountain, Kvarkush and Zolotoy Kamen' ridges, Shilovo flood-plain of Oka river, Lapland Biosphere Reserve and Polisto-Lovatskaya mire system. Some of the IBA of these golden-plover species in United Kingdom are, Bodmin Moor, Breydon Water, The Wash, The Swale, South Pennine Moors, Peak District Moors, Outer Ards, Morecambe Bay, Mid-Essex Coast, Mersey Estuary, Lindisfarne and Firth of Forth. The IBA of the European golden-plovers in Sweden are, Middagsfjället – Dörrshöjden, Lundåkra Bight, Lomma Bight, Bog of Dumme, Lake Ånn – Storlien and Bog of Komosse. The IBA of the European golden-plover in France are, Plateau de Bellefonds, Estuaire de la Gironde, Petite Beauce and Plateau de Bellefonds. These European golden-plover species do not normally occur in forest. They normally occur in altitudes from 0 to 100 meters. The artificial ecosystems and habitats of these species include, agricultural lands, ploughed lands and pasturelands. The natural ecosystems and habitats of these European golden-plover species include, temperate grasslands, tundra grasslands, shrub tundra, boreal shrublands, tundra wetlands, lichen and hummock tundra, highland steppe, estuaries, intertidal flats and salt marshes. The diet of this European golden-plover consists mainly of insects. Insects, insect larvae, grasshoppers, locusts, cicadas, crickets, beetles, spiders, earthworms, polychaete worms, crustaceans and plant material are their primary food. The breeding season of these European golden-plover species is from May to July in northern Europe and Asia. The laying season is from March to May in United Kingdom. These birds are monogamous and pair for life. 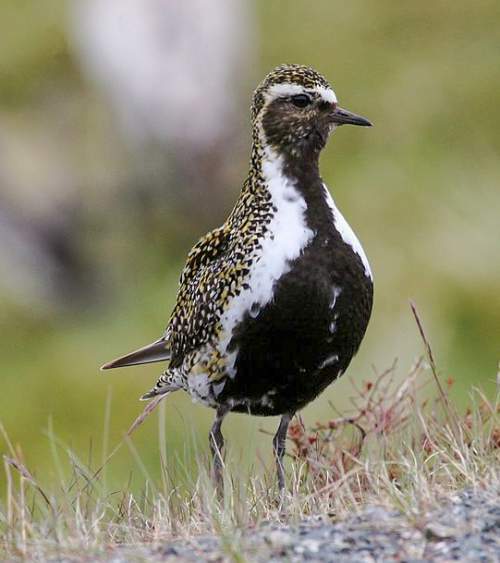 The European golden-plover nesting sites are usually located in humid moss, lichen and hummock tundra and shrub tundra. The nest is a scrape on the bare ground. Low temperatures affect the breeding success. The typical clutch of European golden-plover contains four buff colored eggs with heavy dark blotching. Both parents take part in incubating eggs and caring for the chicks. The chicks hatch out after 29-30 days of incubation. The chicks fledge after 35-37 days. These European golden-plover species are partially migrant birds. The migratory breeding populations are distributed in north-central and northwest Russia, northern Europe, Scotland (UK) and Nordic countries. There are some resident breeding populations in northern United Kingdom. Adult golden-plovers leave the breeding grounds between July and August and the juveniles migrate in September. These European golden-plovers migrate to southern and western Europe, Mediterranean region and north Africa. The return migration occurs in April and May. The global population size of the European golden-plover (Pluvialis apricaria) is estimated to number 1,300,000 to 1,750,000 individual birds. The overall population trend of the species is considered to be increasing. In most of its range, this golden-plover species is reported to be common to uncommon. The generation length is 5.2 years. Its distribution size is about 11,100,000 sq.km. Habitat alteration and destruction, climate change, severe weather and hunting are the main threats that are endangering the survival of these plover species. 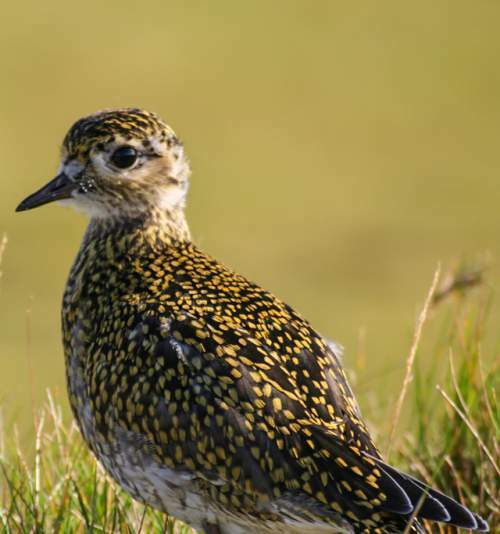 The European golden-plover (Pluvialis apricaria) does not approached the thresholds for being Vulnerable either under the range size criterion, or under the population trend criterion, or under the population size criterion. The CITES (Convention on International Trade in Endangered Species of Wild Fauna and Flora) status is ‘Not Evaluated’ for European golden-plover (Pluvialis apricaria). The two recognized subspecies of the European (Eurasian) golden-plover (Pluvialis apricaria) are: Pluvialis apricaria apricaria (Linnaeus, 1758) and Pluvialis apricaria altifrons (C. L. Brehm, 1831). Current topic in Birds of India: European golden-plover - Pluvialis apricaria.